US, 1980, 90 minutes, Colour. Ralph Waite, Jennifer Warren, Robert Mc Naughton, Jennifer Jason Leigh, Mitchell Ryan. Angel City is a fine telemovie about West Virginia farmers forced to sell their house and move to Florida in search of work. They are tricked into going into a work camp with slave conditions. The film focuses on the family, the stance for integrity and honesty and their ultimate victory. However, the film is quite harrowing to watch at times. Directed by veteran English director Philip Leacock, the film creates the atmosphere of the camp, defines the characters well, invites the audience to share their harsh experience. 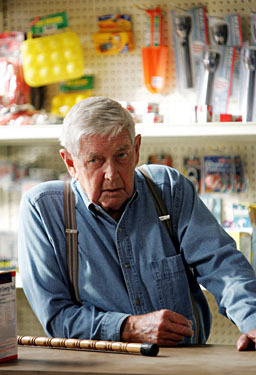 Ralph Waite, soon after his appearance in The Waltons, is excellent as the father. Jennifer Warren is the mother. Robert Mc Naughton (E.T.) and Jennifer Jason Leigh in a very early role are the children. There is a very good performance by Paul Winfield as a sympathetic worker. Mitchell Ryan is credible as the owner of Angel City. Some comments were made about the similarity of this film to John Steinbeck's Grapes of Wrath. In fact it is a '70s-'80s version of the same story. 1. Quality telemovie? Realism? Strong plot and drama? For the wide television audience? Impact? American audiences? World-wide? 2. A sombre story, a portrait of people, recession and the unemployed? Human dignity and slavery? Violence, freedom, abuse of children? Emotional response? Intellectual response? 3. The West Virginia farm settings, on the American roads, Florida? The realism of Angel City? The plausibility of the plot? 4. Florida, the hopes, the gas station attendant and his suggestion for the daughter's prostitution? The father and his looking for a job, being turned down as too old, the agent for Cready? The strange appointment? The hope for a fruit and vegetable stall? In Angel City, trapped, the Everglades and the crocodiles? The alien experience of Florida for the West Virginians? 5. Angel City, the irony of the title, the agent and Cready's deception, the cruelty, people below human dignity, slave conditions, the work, locked in, exploited, owing money to Cready, the destruction of the human spirit, forced to buy wine? Supervised and trapped? The possibility of this kind of slave labour camp in the United States of the '70s and '80s? 6. The portrait of the family and their experience? The father as honest, the lack of work in West Virginia, the strong traditions, the parents in the cemetery, not selling the house? The friends and neighbours and their gifts? On the move, the strong relationship in the family? The wife pregnant? The young boy and not wanting to leave? On the beach - and the symbol of the bikini and the daughter hoping for such a swimming costume? The father and his defence of his daughter, rejected for work, believing the agent, his optimism - and naivety? The meeting with Cready, believing him? Taking the family into Angel City, the locking of the gates and the plausibility of the reasons? The room, the squalor, the promises of money, the hopes? The trucks going out to work, the back-breaking work in the vegetable fields - for the restaurants of the north? The meeting with Sy and the discussions, his warnings? The father not believing them? The poor-tasting food? The dog - and his death? Going to the store, buying the perfume for his daughter? The giving out of the money - and the taking of the money back and the family owing money to Cready? The desperation, the confrontation - wanting to escape, the bribe to the thugs and their bashing him? The visit to the shop, the storekeeper going to the police - and Cready telling lies, even the family and Sy not telling the truth? The birth of the baby and the joy? Everybody helping in? Cready taking the daughter - and the sexual abuse? The celebration of Christmas, the decision that the baby should be taken? The singing of carols and the breakout of violence? Sy and the people turning against Cready and his thugs? The move to freedom - and the possibility of a partnership with Sy in the future? The father as a fine good man, his endurance, blaming himself - and his respect for Sy and the bonds of friendship? A man driven to violence - even wanting to kill Cready? Sy persuading him not to? 7. The mother, her love for her husband, support? Her pregnancy? Life in the camp, trying to make a home, making do? Her daughter taken away, the sexual abuse, talking with her? The Christmas gifts? The birth of the baby? The son and his age, working hard in the fields, wanting to go home? The daughter, her work, unable to keep going? Her hopes, the bikini, the perfume in the shop - and the later Christmas gift? Her being taken away, the sexual abuse, the family and their support of her? 8. Sy, the background of his life and work, his wife and her death, the son, Cready taking the boy? The drinking, resigned - trying to escape but no success? The friendship with the family, explaining the situation and not being believed? Telling the truth? The strong bond of friendship with the family? The possibility of a partnership? The singing in the fields, the Christmas visit - his supporting the father in rebelling against Cready? Persuading him not to kill him? 9. The portrait of the people, their backgrounds, trapped by Cready in the work camps? The quality of life? Age, race? The celebration of Christmas? Helping the family - especially the midwife and the birth of the child? 10. Cready and his thugs, smooth talking, the lies, the brutality, plausible answers? The bashings of any trying to escape? The smooth talk with the police - but the police not believing him? The money, car? The brutality of the racket? The vengeance of the people against them? 11. The American tradition of freedom and slavery, work, recession and exploitation? The integrity of the ordinary person, the ordinary family?